Maidanak Laboratory is a part of Sternberg Astronomical Institute of Moscow State University. It was founded in 1974. Now the main scientific research activity of the Lab staff is focused on gravitational lensing, surface photometry of spiral galaxies, galaxy clusters. 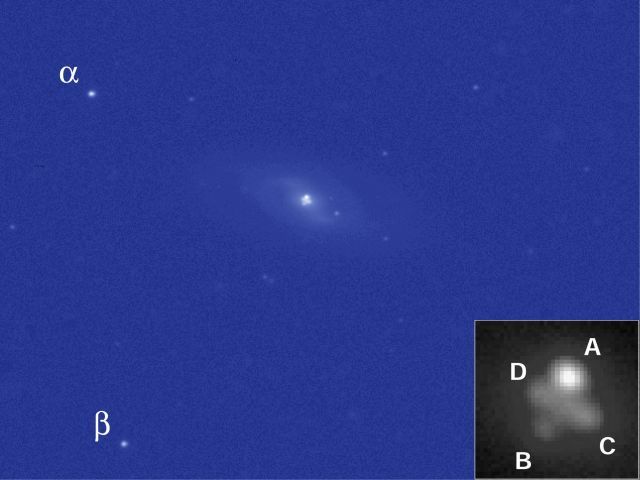 Observations are conducted with 1.5 meter RC telescope AZT-22 of Maidanak Observatory (Uzbekistan). In 1972, Sternberg Astronomical Institute of Moscow State University (SAI MSU) initiated a search of sites with the best astroclimate in Central Asia. Mountain Maidanak (150 km to south from Samarkand, Uzbekistan) was chosen after the continuous investigation of meteorological conditions, temperature fluctuations and seeing quality in different testing sites. At the end of 1972, SAI MSU have finished mainly the construction of Maidanak Observatory. The main instrument of Maidanak Observatory is 1.5 meter RC telescope (AZT-22) manufactured by optical firm LOMO (Russia, S-Peterburg). Optical shop test confirmed the high quality of the optical system AZT-22 limited diffraction optics. The 1.5-meter telescope was installed in the dome equipped with ventilator system for the smoothing of the inside dome turbulence. The isolated summit Mt.Maidanak (2600 meter) have good astroclimatical parameters: 2000 clean observational hours per year and mean seeing (FWHW) is about 0.7 arcsec (Artamonov et al. 1987, Ehgamberdiev et al. 2000). After the USSR disintegration Maidanak Observatory property was assigned to Ulugh-Beck Astronomical Institute (Tashkent, Uzbekistan). The excellent 1.5 meter telescope, good seeing and a large number of clear nights make possible the long-term monitoring of gravitational lenses system (GLS). 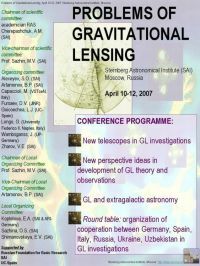 The collaboration were carried out by three groups from Ulugh Beg Astronomical Institute (Tashkent, Uzbekistan), Astronomical Observatory of National Kharkov University (Ukraine) and Sternberg Astronomical Institute of Moscow State University (Russia) for making of monitoring selected GLS. Because of technical reasons, we had to use three different CCD cameras in our observations, Pictor-416 camera in 1995, Pictor-416 and TI 800 x 800 cameras in 1997 and 1998, and ST-7 camera in 1999 and 2000. And because of technical reasons again, both f/8 and f/16 focal lengths were used in observations. The LN-cooled TI 800 x 800 camera, with pixel size of 15/u, kindly provided by Prof.D.Turnshek, unfortunately revealed some peculiarities, caused by the charge transfer inefficiency, that is characteristic for the CCD's of this generation. In particular, noticeable stretching of stellar images in the direction of charge transfer is observed, as well as a dependence of the PSF upon coordinates at the chip plane. In addition, sensitivity irregularities of the chip can not be corrected satisfactorily, with the output of the flat-fielding procedure dependent on the signal level. All these peculiarities reduced the actual accuracy of photometry. Since October 2000 CCD LN-cooled SIT 2000*800 camera was installed on 1.5 meter telescope. The manufacturing of this CCD camera was supported by Maidanak Foundation created by Henric.E.Nilson (Bergen, Norway). 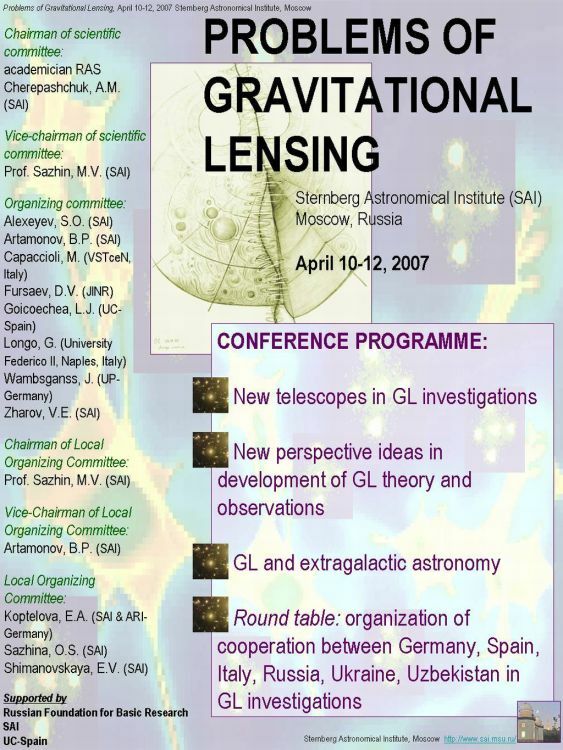 Last observations of GLS in 2000-2003 were made with new CCD SIT camera. Lab works in collaboration with Ill-posed Inverse Problems Group of Physics Faculty of Moscow University (Russia), Kharkiv National University(Ukraine), Institute of Radio Astronomy(Ukraine), Ulug-Bek Astronomical Institute(Uzbekistan).